The Spring 2007 Dashboard update for the Xbox 360 adds H.264 playback support. H.264 is a very advanced video codec used in Blu-ray/HD DVD, and offers better quality and smaller file sizes than DivX/XviD, at the cost of slightly more processing power (and encoding time). Processing power becomes less of an issue with the powerful Xbox 360, and since the Xbox 360 does not support DivX/XviD (and is unlikely to do so), H.264 then becomes an ideal format for those that don't want to use WMV. Please note that some people have had success with playing back standard resolution MOV (QuickTime) and certain high resolution MOV (QuickTime HD) files directly without further re-encoding, so you might want to try this first. QuickTime HD files are already encoded using H.264, but some are encoded using settings which are incompatible with the Xbox 360's H.264 support. The PS3 also supports H.264 playback, and you can view the PS3 version of this guide here - the PS3 has an advantage over the Xbox 360 in that it supports AAC 5.1 channel audio (although with limited decoding support). Make sure you are able to playback H.264 clips on your computer first. Consult our H.264 Playback Guide if you are unsure. This guide uses MeGUI to provide the H.264 conversion from a DVD source or from other file formats (AVI/DivX/XviD/MOV/HDMOV - many other formats, such as MPG, are also supported). MeGUI is one of the newer tools that's been designed with H.264 encoding in mind. This guide is very similar to the MeGUI H.264 Conversion Guide, except it simplifies a few things and the H.264/MP4 file produced has Xbox 360 compatibility in mind. It also covers how to playback the MP4 file on your Xbox 360 using the TVersity or Zune software. This guide is aimed at intermediate users that already have some knowledge in regards to video conversion. As such, basic knowledge of things such as framerate and resolution is recommended (and since you are here to experiment with H.264, this assumption is not all that unrealistic). You will also need to know some network basics for Xbox 360 to Zune software connection, such as knowing what your network IP address is, configuring your firewall or port forwarding if your computer is not on the same LAN as your Xbox 360. If you're using Windows XP, the first thing you need to do before you can even install MeGUI is to download and install Microsoft's .NET Framework version 2.0. It's a fairly large file and installation could take more than half an hour. If you're already using Windows Vista or 7, then the .NET Framework 2.0 is already installed. The next thing you need to download and install is AviSynth. If you're using Windows 7, because Microsoft now includes their own codecs pre-installed with the OS, this interferes with the way MeGUI works and you'll need to install compatible codecs (for example, ffdshow) and use the Preferred Filter Tweaker for Windows 7 to change the settings so that the Microsoft codecs won't be used within MeGUI. You can download and install ffdshow (remember to choose the 64-bit version if you're using 64-bit Windows), and then you can download and run the Preferred Filter Tweaker for Windows 7 tool individually, but if you're starting with a brand new Windows 7 system, you might want to install the K-Lite Codec Pack, which works well with MeGUI (I recommend the Full version of the codec pack). If you're using 64-bit Windows (Vista or 7), then you should also download and install the K-Lite 64-bit add-on pack after you install one of the K-Lite packs (Full or Mega). The advantage of using the K-Lite pack is that it installs both ffdshow and the Preferred Filter Tweaker for Windows 7 tool, and in a configuration that is tested to work well. 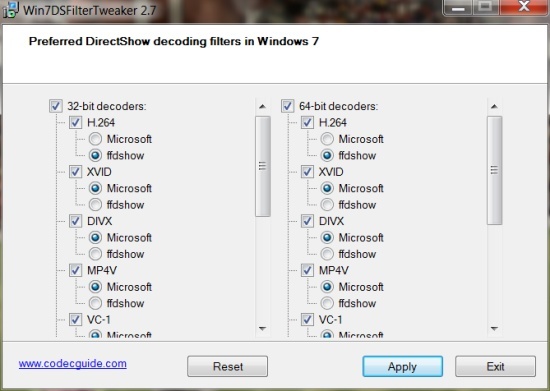 In any case, once Preferred Filter Tweaker for Windows 7 has been installed, start the tool and in the section where you configure the preferred DirectShow decoding filters for Windows 7, you need to make sure at least the "H.264" option is set so that ffdshow is used, instead of the Microsoft codecs (for those experimenting with VC-1, you need to set its settings to ffdshow as well). If you're trying to load or encode any video format in which MeGUI appears to hang, or give you an error in relation to AviSynth, then you can come back to this tool and ensure the video format is using the ffdshow codec, and not the Microsoft one. Press "Apply" to apply the changes and then exit the application. You can now go on and download MeGUI. Install MeGUI. Start it up and most likely, it will prompt you to update the software used by MeGUI - click "Yes" to launch the update Manager. Press the "Update" button to start the update process - MeGUI will automatically download and launch the install for the required software. Note that when MeGUI asks you to import H.264/XviD/Audio/... profiles, right click and select "Select All" to import all of them (overwrite existing ones if asked). You will most likely get a "1 file had problems" error, this is because the "neroaacenc" software cannot be downloaded automatically from MeGUI. To download it, go to this page, and download the ZIP archive. There are several files in the ZIP archive, but the files we need is NeroAacEnc.exe. Extract the .exe files to your "megui\tools\neroaacenc" folder (eg. "c:\program files\megui\tools\neroaacenc\win32\neroaacenc.exe"), creating one if it does not exist. When all the updates are completed, you can now close the MeGUI updater. If you've extracted neroaacenc, you might need to access the "Settings" option from the "Options" menu, and go to the "External Program Paths" section. For "NeroAacEnc", use the browse button to locate where you extracted the neroaacenc executable file (eg. "c:\program files\megui\tools\neroaacenc\win32\neroaacenc.exe"). Press "Save" to close the settings window. Also, MeGUI often doesn't update to the latest x264 version, so you will have to do this manually. First, from within MeGUI, go to the "Tools" menu and select "Settings". Go to the "Program Paths" section and see where MeGUI accesses the x264.exe file. Then go to our x264 software page and check the latest version - if it is newer than the version listed in MeGUI, download and save the x264.exe to where MeGUI accesses the x264.exe file to replace the old file (usually c:\program files\megui\tools\x264\x264.exe - you might want to keep a backup copy of the old version of x264, just in case the new version isn't compatible with MeGUI). Note that a 64-bit version of x264.exe is also available to download here.